When you have a one-day big money event, there is a lot that can happen in the course of that day. 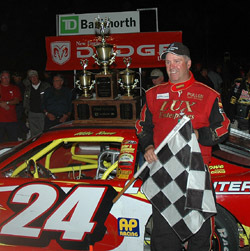 Mike Rowe proved it in the TD Banknorth 250 at Oxford Plains Speedway (ME). Mike Rowe was quick in practice Sunday morning and his chances of being a contender were judged to be pretty good early in the day. That topic even came up in a conversation between Rowe and Speed51.com’s Justin St. Louis while practice was still going on. "A lot of people think you'll get [win] 150 today,” St. Louis mentioned to Mike Rowe. "Do they? By God I hope so," replied Mike Rowe. Well, they thought that he might get #150 before Oxford’s dreaded heat races got underway. Without the benefit of time trials, Rowe had to race his way into the starting field just like everyone else. With 71 cars showing up for 40 starting spots, that task would be far from easy. Come late afternoon, there was only one way for Rowe to get in the show. That was to finish first in the 29-car, 50 lap last chance race. Second place or worse meant that Rowe would be watching his son race from the grandstands. Rowe got the job done and won the race without much drama. He would have to start the 250 in the rear, but that was fine with him. Mike Rowe was just happy to have the heat races behind him. Rowe woke up Sunday morning as the favorite for the race. After all, he had won the 250 twice before, won at Oxford 149 times in his career and dominated this year’s two IBG-PASS events at Oxford before a pair of tough breaks kept him from winning those tune-up races. There was also the factor of family pride. Rowe watched his son Ben win the event for the past two years running. The two Rowes were tied at two wins each entering this year’s event. That gave Mike a little incentive to pull ahead of his son. “He said that there was no way in hell that I would get three before he did,” laughed Ben. Since his starting position put him in a different zip code than the rest of the 250 field early on, Rowe wasn’t the story for most of the race. pass him on the outside. Kyle Busch made his way through the field from his 28th starting position and took notes. He learned from the others and used lapped traffic to set up an inside pass for the top spot. Busch’s tenure out front only lasted three laps before a caution came out for power steering fluid dumped by the wounded car of Mulkern. Busch pitted for tires while Cassius Clark was able to use pit strategy to do what the outside groove couldn’t at that point: he stayed out and took the lead. Clark’s lead only lasted a few laps before ACT refugee Patrick Leperle took over and stayed out front for awhile. He gave up the lead to pit for tires. Like Scott Mulkern, Travis Benjamin would exit the race with a car that appeared more than capable of winning. Unlike Mulkern, his exit didn’t consist of simply pulling the car to the infield pit area. Benjamin appeared to lose an engine in his #17 ride and when it went, it erupted in a ball of flames. Benjamin sailed off the turn two banking on fire, but was able to exit the car before it came to a stop. In fact, Benjamin even had to grab a hold of his car’s rollcage to keep it from rolling off the banking and towards the pit area before rescue crews arrives. He was alright after the incident, but his car was not. 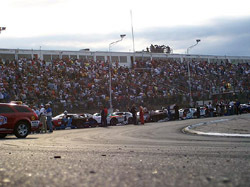 The next act featured a battle for the lead between Kyle Busch and Johnny Clark. Both spent time out front before Busch pitted again for fresh rubber. He lost track position by that move and never got a chance to make it back up again. This appeared to put Johnny Clark in command ahead of a surprise charge by Dave Nichols. The local driver wasn’t even considered to be an Oxford regular ,since it was the first time that he raced all year. 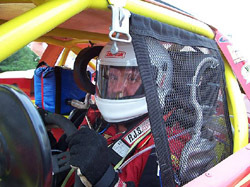 The brother-in-law of Tracy Gordon had been busy serving his country in the Coast Guard and racing just wasn’t on his mind. So imagine the surprise when it looked liked he’d be duking it out with Clark for the victory. Well, that was until Mike Rowe was heard from. With 20 laps to go, Rowe came alive and passed Nichols for second. Ten laps later, he zoomed by Clark. Rowe only led 10 laps all night long, but he led the right 10 laps. “You know, we just had to be patient and that's what I did all night,” said Mike Rowe. “I just stayed there and I didn't make any stupid moves, and it paid off. The only thing that would have made Mike Rowe happier near the end of the race is if Ben Rowe was right there battling with him instead of dropping out of the race early with multiple problems during the night. “I wish [Ben] could have been up here with us, and you know, it just didn't happen,” said Mike Rowe. “But he'll probably be up there next year. But Ben was just to see his father rule the race. Plus, there was a hidden bonus to Ben when his father won. The younger Rowe works for his father’s trucking company during the week and a win on Sunday night makes for an easier work day on Monday. 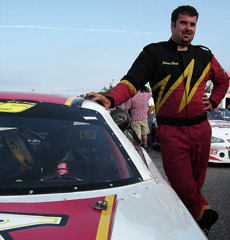 Speed51.com will have much more from the 250 later this week in our TD Banknorth leftovers.